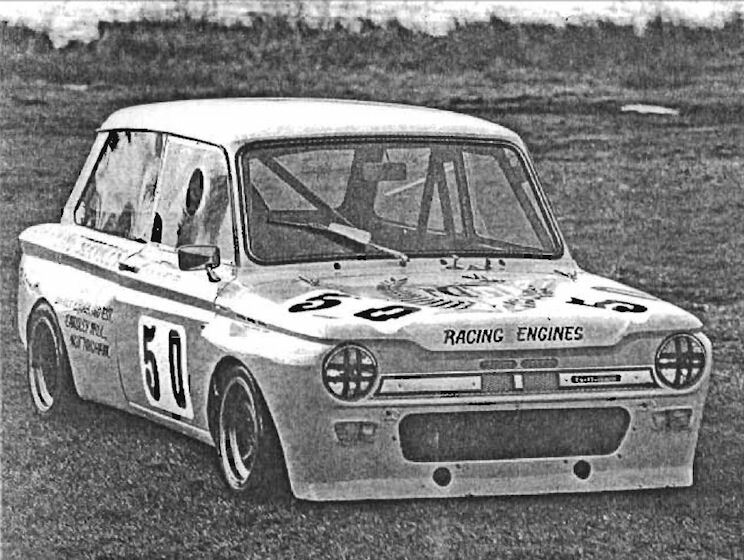 Nick Humphrey's Imp is clearly not the standard item, as the extended wheel arches covering wide Avon racing slicks show. 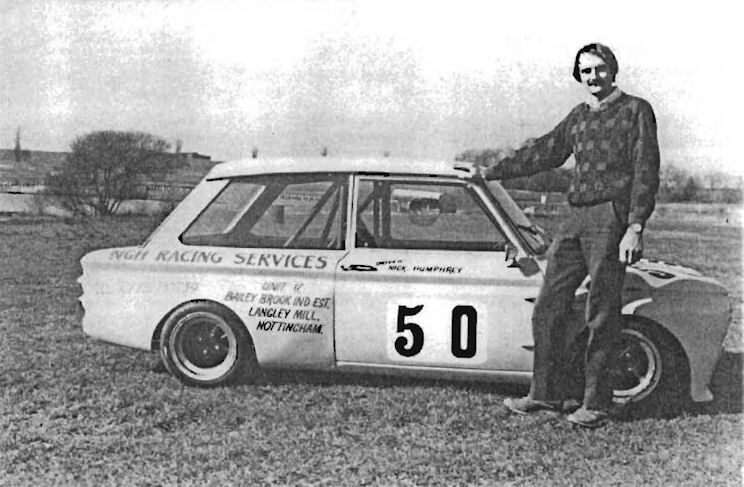 Many years after the Bevan-McGovern successes, Nick Humphrey was very competitive in an Imp. But his Imp had 1200cc and he was competing in the up-to-1300cc class. 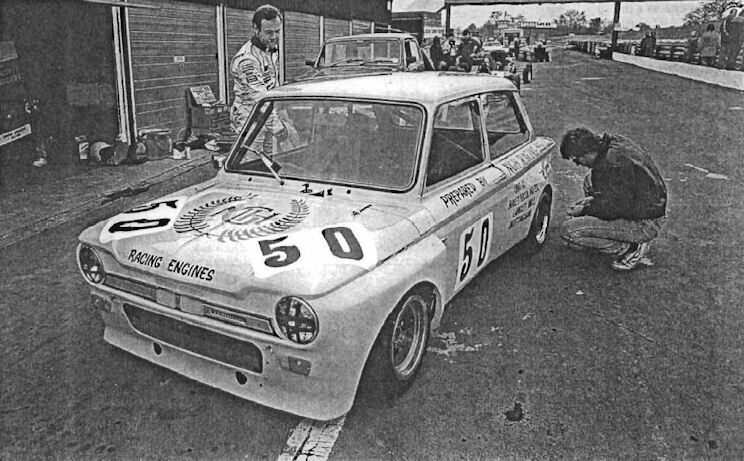 After a spell as a mechanic for Geoff Farmer, Nick was rewarded with a test in Farmer's Imp. And he kept to Imps for a few years after. 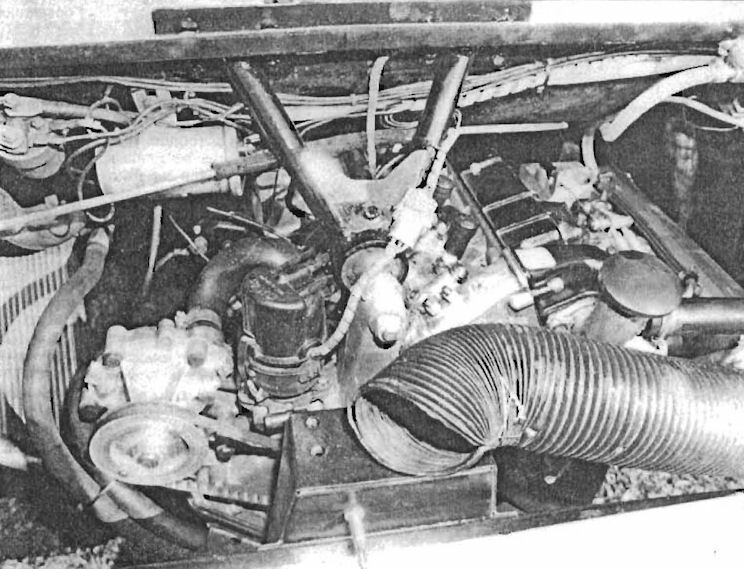 He fairly quickly started assembllng the parts necessary to put an effective racer together and It was not long before he was out campaigning a 1-litre Hillman. 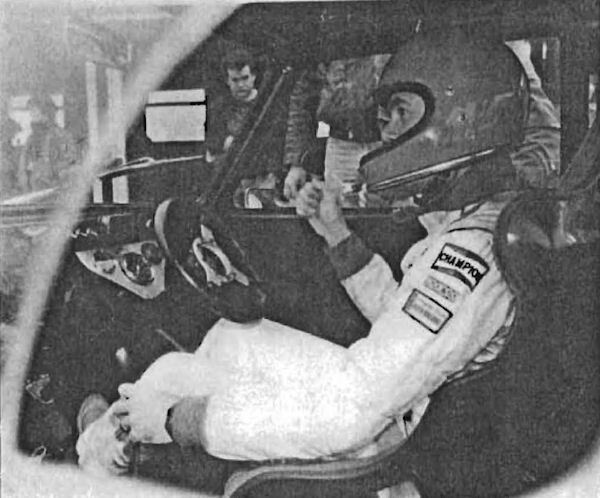 He won the 1-litre Mod Saloons Championship. He was officially in the 1.3-litre class in 1987, taking his engine up to 1200cc. But, unbelievable misfortune, after winning the season-opening race at Silverstone, on the lap of honour the special and very expensive crankshaft broke! Lack of funds precluded the immediate purchase of a replacement, so he reverted to 1040cc (standard stroke and largest possible bore), just big enough to keep him in the 1300cc class, but giving him no reallstic chance. The winter rebuild, complete with new steel crank, was finished only the day before the Track Test of the Performance Tuning magazine (see: Literature) at Mallory Park on a sunny March morning. He combined his business of preparing competition Imp engines and dealing in second-hand race spares for the marque with developing and running his own racer. His 1988 car marked the culmination of that development programme and the 1988 season saw him moving up to the 1.3-litre class. It's a neat arrangement, with a 11ft-up flap to prevent accidental engagement of first or reverse gear when on the move. The gate pattern is reversed, in true racing style, with first out on a limb, back and to the left, and the other four forward slots arranged in conventional 4-speed-box fashion. It's a two-handed job to find first, but this is not a problem, since that lowest ratio is only ever needed to pull away from the line - and even then only to gain maximum acceleration. Strapped to the floor alongside his seats is his record box for 7-inch 45rpm vinyl records: housing for the lead-acid battery. Flicking a row of switches and turning the battery master energises all the electrical systems, then a quick stab on the starter button brings a fleeting churning before the engine starts to run. Even with limited throttle openings (to give the new engine a chance to bed in), it is clear that the 1200 power plant has bags of torque low down. 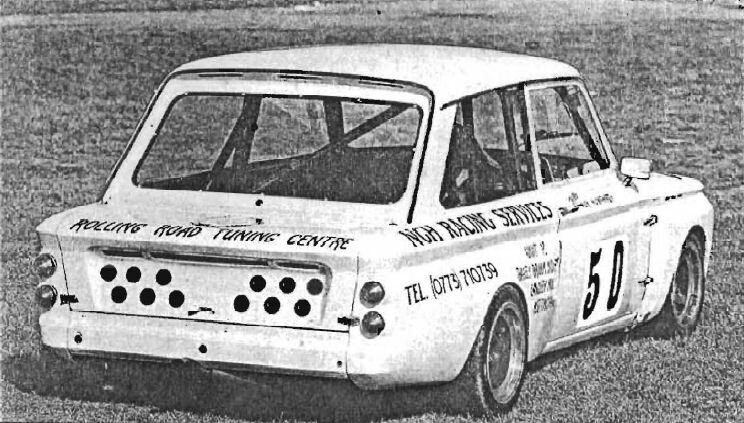 Unlike some of the space-framed silhouette racers, this Imp is still very recognisably an Imp. 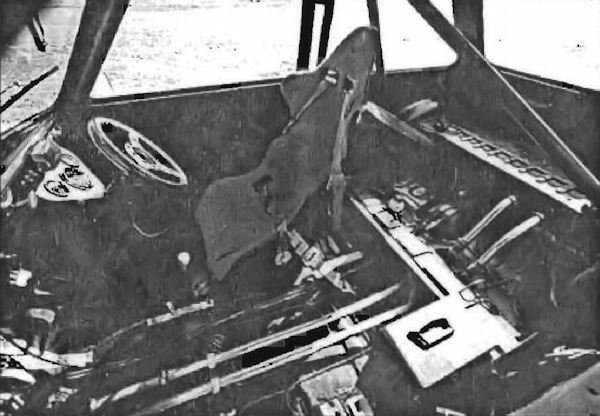 The floorpan, roof and bulkheads are in the original steel, with glassfibre one-piece front, rear quarters, doors and engine cover. 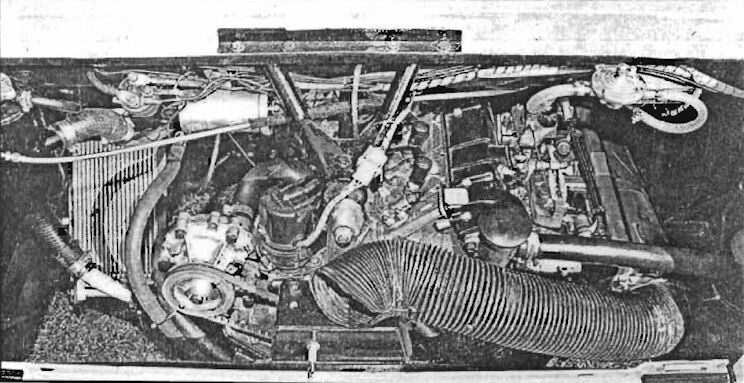 The engine sits in its usual place, behind the rear axle line, where its mass provides plenty of traction but creates plenty of headaches for those endeavouring to set the chassis up for good balance at all times. 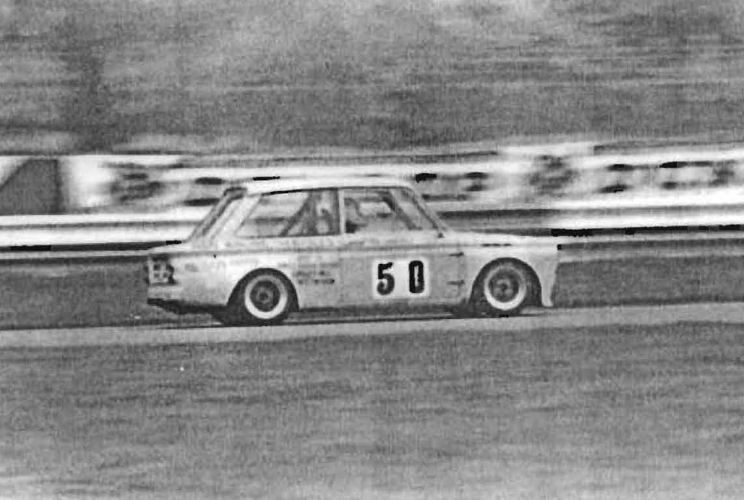 Nick always uses the Sunbeam version of the alloy cylinder block, because it is substantially stiffer than the Hillman item, although all production Imps shared the same 875cc capacity. Taking the wet-liner bores out as far as possible brings this up to 1040cc, but Nick then adds his long-stroke steel crankshaft to give him 1200cc. The pistons are far from standard. The head has considerably enlarged valves together with modified ports and chambers. The valves themselves are from the Cosworth tulip range and they are held in place by double springs and lightweight titanium retainers. The single overhead camshaft is machined to a profile laid down by NGH Racing (this is Nick's company) and it runs in a special solid carrier. Everything is assembled with meticulous attention to reducing friction. Potential gasket problems are avoided by the use of gas-filled sealing rings let into grooves specially machined around each combustion chamber. These combine with water-jacket seals to do the job of a conventional gasket. Twin 45DCOE Webers sit on a purpose designed manifold and supply just the right fuel mix to suit this engine. Most 'experts' maintain that the 45s are too big for the capacity, but NGH have emphatically proven them wrong. Inlet tract length is critical, as is that for the exhaust - also from NGH's design pen. 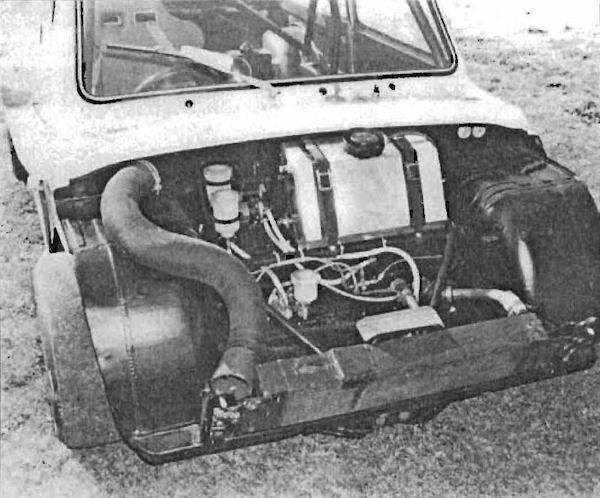 The manifold is of an unusual 4-into-l style and the pipework is brought across the rear of the car to optimise its length. The rubber doughnuts are retained on the driveshafts. Nick tried fitting constant-velocity joints, but the loss of the rubber's shock absorbing qualities split the gear box asunder. However, having had a coupling break, with dire consequences, Nick now changes them after every outing. The regulations require that the standard suspension pick-ups be retained, so the basic layout is unaltered. But careful reading of those rules has allowed Nick to extend those pick-ups and alter the geometry in that way. Again contrary to popular opinion, the rear is almost solid. A pair of 150 lb/in motor cycle springs and dampers sits inside the usual coils, which themselves are rated at 700 lb/in. So it is almost impossible to bounce the back by hand. The front is similarly soft - Nick's contention being that with all that engine weight hanging out of the back, you've got to have this set-up to keep it under control. And with adjustable Konis all round, he is absolutely right. The small leather steering wheel turns the little Hillman into each corner instantly on demand and even on the interminable and much-pot-holed Gerrard's the car is not flustered in the slightest. The front-rear balance is perfect, with not even a hint of tail-wagging or understeer. Mr H completes the bedding-in process. Out he goes and he is soon flying, bringing his times steadily down towards the lap record. In he comes again, this time to top up the frontmounted tank. He invites me to take the wheel again. By now, he has moved the red line up to the 8000 mark: 'Go and have some fun ', he says; and I do. Those extra revs really give the Imp its head; yes, its got plenty of low-down grunt, but over 7000rpm it takes off - and the gearing is ideal for Mallory. Now I really learn how quickly the thick Avon slicks will allow the car to corner. With each lap, I am pressing that little bit harder, only to find that the Imp simply sets itself up in a gentle four wheel-drift with all the poise of a prima ballerina. Cars that were initially overtaking in droves are now dropping behind - and still the car feels as though it is taking it easy. The overspeeding is only momentary and the tacho may have been driven artificially high by inertia from the engine's instant throttle response - and there is no obvious damage - but I make hasty exit to the pits and own up, just in case. An outwardly calm Nick Humphrey says 'Don't worry. We'll just strip the engine down and make sure it is OK' - and he's racing in four days! As an example of NGH's work, the Imp something to be proud of. It is beautifully engineered and does its job accordingly. 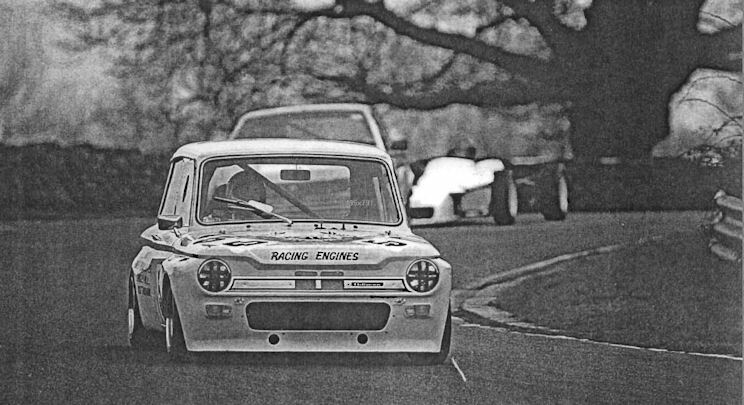 The story continued a few days later: it transpired that over-revving made one valve and piston touch but after a quick rebuild Nick took the Imp to a class victory at Mallory Park the next weekend. Much of the detailed spec is on the secret list, for obvious competitive reasons. Driving a racing Imp - what's the point in this day & age? When its Coventry Climax derived 875cc engine is bored and stoked to 1200 there's every point, as Ian Ward discovers around Mallory Park. Dellorto carbs, Filter King, NGK plugs etc. Engineering facilities for cylinder heads, blocks, pistons etc. A chap called Nick Humphrey raced a 2.0 TS Turbo in the UK, but I don't know any details. He runs a tuning business in Leicester and might be able to help.